From streaming media to grocery stores – all markets seem to be exploring the use of consumer data in an effort to create more personalized and targeted experiences with the goal of increasing engagement and loyalty. Countless industries continue to capitalize on their consumer data and leverage newer methods of applying analytics, like machine learning and cognitive computing, to gain fresh insight. While consumer data from other industries, like retail, have the luxury of being more defined, consumer data in the healthcare industry is a lot trickier to grasp. The good news is that healthcare is catching up to other industries, and human resource professionals are using data and analytics to enhance employee benefits, engagement strategies, and wellbeing programs. The world of healthcare has historically focused on using clinical and claims data to drive individuals toward programs and interventions based on their care needs. This method is limiting and only views the individual as a patient. The industry needs to take a holistic data approach and leverage consumer data such as demographic information, voting records and behaviors. It should also factor in an individual's desires, which may have the most impact. What do they want to do and what will motivate them to accomplish it? Treating individuals as consumers versus patients will provide a higher, more efficient population impact and maximize the value of health program offerings. Healthcare is filled with complexities, redundancies, is highly regulated and many systems aren't synced. When we do come across healthcare data, it's usually insufficient, fragmented, and depersonalized. Ninety percent of consumer data lies outside of the healthcare system. The 10% that we do have is made up of clinical and claims information, and is collected when people are in patient mode. What's missing are consumer communication preferences, personal goals, lifestyle wants, buying habits, motivators for making healthy choices, etc. This lack of significant information is one of the reasons why healthcare is lagging behind in the data and analytics space. So, how can employers get their hands on the data they need to drive change in their employees' health behaviors and how can they leverage analytics and apply it to their wellbeing and benefits strategies? Discover who has what needs and who is impactable. This information can come from a combination of clinical and behavioral health data. Once these have been identified, establish what channel is the most appropriate to get them engaged, and ultimately to stay engaged. Most importantly, think about how you will provide your employees with services and programs that will create the most change and which plans they will engage with more. This will allow you to refine targeting and recommend actions. As analytics continue to evolve, it will not only tell us what has happened and why, but it also shows us what will happen and how we can influence the outcome. According to the Harvard Business Review, one of the earliest uses of big data was to generate new insights around predictive analytics in an effort to define patterns and eventually target interventions. Amazon’s recommendation engine generates 35% of their revenue. If we apply this same principle to health programs, imagine the impact we can have on the health of employees by recommending relevant resources, like a financial planning program for employees with college-bound dependents. 1. Not all populations are the same, so don’t use a generic model for everyone. 2. Know your target population. It’s difficult to manage at-risk individuals if you do not know why they are at-risk or have confidence that the individuals you are targeting are the right ones. 3. It’s not just about data, but it’s about utilizing the right kind of data. 4. Use relevant data to create a more complete picture of each individual. Make it easy to find the resources employees need. If employees aren’t engaged in their health, many times it is because they don’t know how to find the resources available to them. 5. Make sure the analytics are actionable, easy to implement, measurable, and are continuously updated to provide improvements and more value. 6. Utilize advanced analytics technologies, such as machine learning, to optimize accuracy as well as focus resources on the right problems to solve. For example, a health plan saved more than a million dollars by working with an analytics firm to apply predictive analytics to a population segment and decrease unnecessary emergency room utilization. By utilizing a large consumer database, the analytics partner built a model for its newly enrolled ACA population that identified individuals who were three times more likely to be hospitalized. Once identified, the new enrollees were targeted for care management programs and interventions. By understanding the target population, the health plan saved approximately $1.5 million due to avoided inpatient admissions. From creating personalized wellbeing programs to aligning targeted behaviors with the right incentives, analytics are the key to powering employee health engagement. While it may be uncharted territory for healthcare, there is a lot that has been learned from other industries and is being effectively applied to employee health programs. Looking to get more data smart? 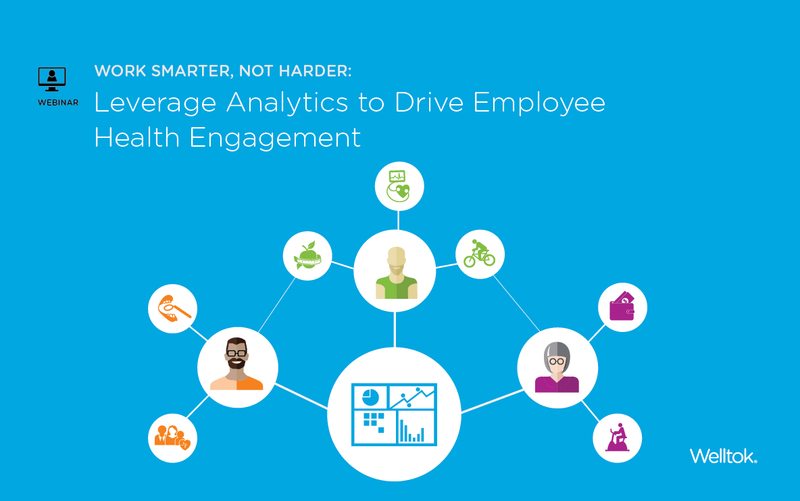 Click here to sign up for a complimentary webinar on May 10th where I'll show you how to apply advanced analytics to improve employee wellness.